The word intarsia in meaning is define the type of decorative and applied art, build upon incuting to the base frame of solid wood plates the other type wood pieces or deverse colors pieces of materials not the wood kind. 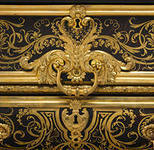 Often use ivory marquetry, metal type bronze, mother of pearl and other. Intarsia is a very meticulous task, requiring a compositions of special skills and diligence.